Here is good news for the people who can not see and still want to use the smart phones as the world's first smartphone for blind people is going to be launched. Soon, they will be able to read SMSes and emails on this phone, which converts all text into Braille patterns. He was motivated to develop the device when he realized that so far, technology was only serving the mainstream and ignoring the marginalized. He is collaborating with IIT Delhi on making the prototype, which is currently being tested at L V Prasad Eye Institute in Hyderabad. According to Sumit Dagar,whose company is being incubated at the Centre for Innovation Incubation and Entrepreneurship, located in IIM Ahmedabad campus. 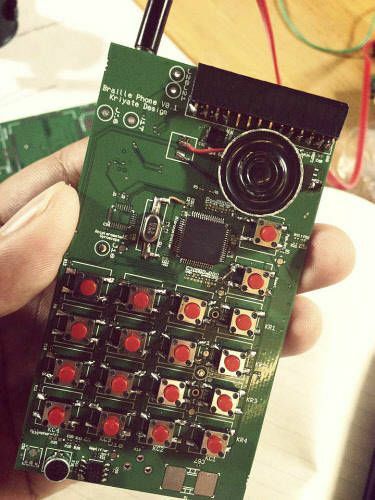 "We have created the world's first Braille smartphone," "This product is based on an innovative 'touch screen' which is capable of elevating and depressing the contents it receives to transform them into 'touchable' patterns,"
"The response during the test has been immense. It comes out as a companion more than a phone to the user. We plan to do more advanced versions of the phone in the future,"
Dagar started the project three years ago while studying interaction designing at NID. After working with a couple of companies, he gave up his job to concentrate on his technology, formed a team of six people and started his venture, Kriyate Design Solutions. Currently, the venture is being funded by Rolex Awards under its Young Laureates Programme, in which they select five people from across the world every two years and fund their projects. The smartphone uses Shape Memory Alloy technology, based on the concept that metals remember their original shapes, i.e. expand and contract to its original shape after use. The phone's 'screen' has a grid of pins, which move up and down as per requirement. The grid has a Braille display, where pins come up to represent a character or letter. This screen will be capable of elevating and depressing the contents to form patterns in Braille.